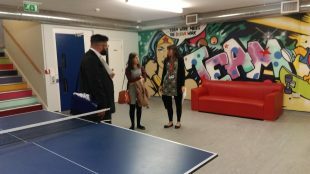 I and two other colleagues recently had the chance to spend time at Evolve Housing + Support in East Croydon as part of the department’s connecting programme. Based originally in East Croydon, Evolve Housing + Support left the YMCA movement in 2015. The rebranding reflects the values of the organisation, which differ from the perception often encountered in the wider YMCA movement as 47% of their customers are not ‘young’, they do not help just men and they are completely secular. Since their rebrand they have since seen an increase in the number and quality of applications for jobs with them. Evolve are the third-largest provider of supported housing in London. They work across 4 London boroughs and with around 1500 people each year, providing shelter and support to help them escape homelessness. They provide supported housing, community hosting and support the empowerment of individuals to develop the skills they need to move on to independent living. Evolve are guided by a set of values that I saw repeated time and again throughout the day, from both the management of Evolve, and between the Evolve and their customers. Notably these values are underpinned by the idea that everyone is an individual. They recognise that the focus must be on the needs of the customer and not the needs or requirements of a local authority. We also learned about some of the challenges faced by the organisation, such as the possible impact application of local housing allowance (LHA) rates might have on the capacity to provide housing. It highlighted to me how policy might not always have been made with the user as strongly at the forefront of the mind, and parallels the user-centred values of digital teams across government and the advent of a more Agile, service-design approach. The services provided by Evolve very much reflect their values. We visited 2 services, Palmer House and Ingram Court and both emphasised how important it is to tailor services to individual needs. They offer a programme of optional support to residents to help them reach their potential, and at Palmer House we joined in on a health and wellbeing session on the side effects of drugs and alcohol (learning rather a lot!). We then walked to Ingram Court, another tailored-service, this time for 16-22 year olds. Tucked away from the road it had a lovely open space at the back of a house facing onto the residential road, surrounded by a variety of housing types depending on individual need. It had several communal areas and it was here we saw one of the projects that had been carried out by the residents. 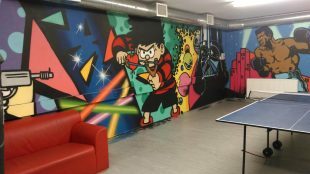 The photos below and above show a graffiti art project that we were particularly stunned by. Visiting Evolve has already changed my outlook. Evolve is a really effective organisation from which we can learn a lot; both from their own experiences to inform our policy making and service delivery, as well as from their responses to similar challenges, such as budget cuts and the need to clearly define our brand and get our mission right from the start. Coming from the digital team, what I found most striking was the fact that beyond central government, a user needs based approach is taking hold. The same mantra is repeated that user needs, and not business needs (or local authority requirements), should always come first. Seeing how things are done on the ground could benefit any organisation. It is valuable both personally and professionally to really grasp the difficulties organisations can face when facing tough, real-world challenges. We need to understand those difficulties and environments in order to design, as well as implement, a supportive policy environment - even when faced with obstacles ourselves. On a more personal level, seeing how any other organisation can work will really highlight what is and is not good practice and culture, as when it is clearer when taken out of your own day-to-day context. Connectivity is key; hence YourHealthMatters.com coming soon! Its great to see the focus on the needs of the customer and not the needs or requirements of a local authority for a change. This sounds great!